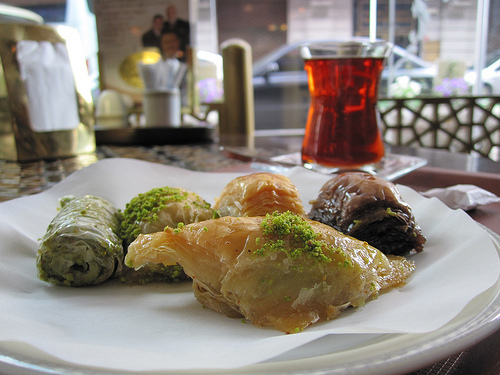 The Baklava plate from Karaköy güllüoğlu, Istanbul (not Constantinople), Turkey! 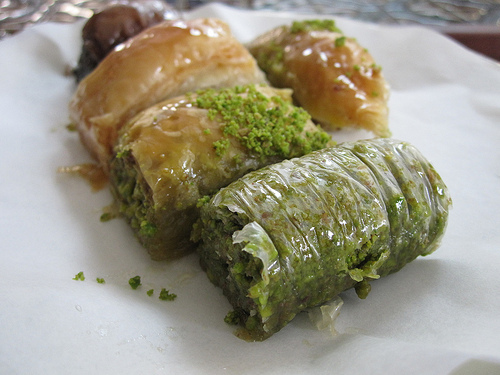 The baklava is from one of the better known baklava places, and one that is well known on TripAdvisor. Had it not been for them, I would have never found it. I have thee name under the picture in my picasa and it's located on the north side of the golden horn (if you find Ayasofia and then cross the nearest bridge you're right by it). The plate, plus turkish tea, was about $5-6 and the baklava was amazing. Extremely fresh and varying tastes, including the chocolate baklava which tasted like a dark chocolate brownie at it's best with honey. The one right beside it in the picture was a walnut baklava and I wish I had grabbed one extra to get a better shot, but for some reason I was on a pistachio trip (which is a nut I have traditionally not liked). The other three are various levels of pistachio, from some (the triangle) to entirely (the green roll at the end). Visit the Karaköy güllüoğlu website here.